OK. So you are going on holiday – yipee. Next question – what to pack? 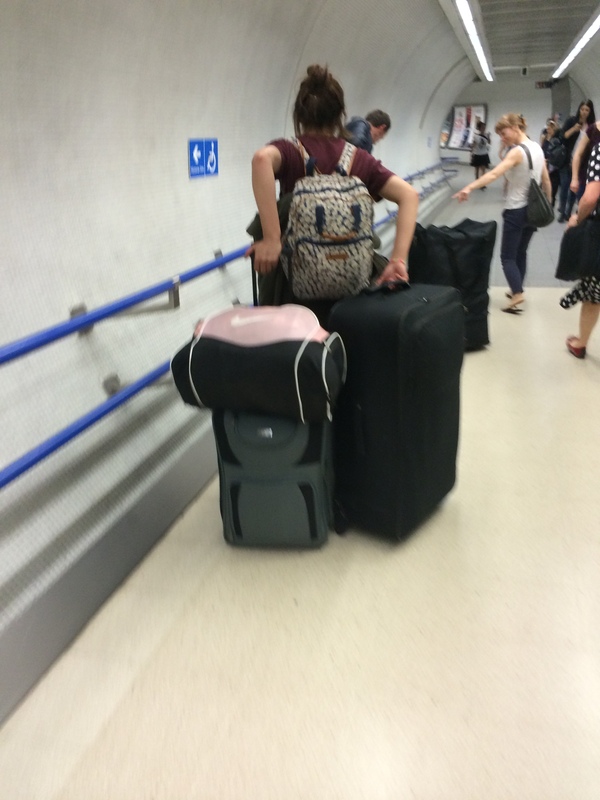 I get unreasonably angry with visitors to London who insist on driving wheeled, wardrobe-sized suitcases onto the tube. Our congested, crushed tube. Our commute gets a whole lot worse when a suitcase the size of a small child encroaches on our space. Despite being well aware that our weather is changeable I wonder what eventualities they have packed for? Just how many outfits do you need for one week’s holiday in London? Or anywhere for that matter? I have one suitcase and it is small enough to qualify as hand luggage (even on Ryanair). This is important in terms of maneuverability, ease of travel, and reduced chances of finding it has gone to Stockholm when you are in Madrid. And, these days, budget airlines charge for putting your luggage in their boot. With less space to play with – what to pack? Obviously this depends on where and when you are going. I have based this proposal on a summer trip to the French countryside, but it would work for London too. It covers all the weather bases, and can be flexed. It is formulae that allows you to make changes to accommodate any specific needs (e.g. dressier, hotter weather, more swimming etc). And if something really surprising happens – like non-stop rain, or you get invited to a wedding, then you might have to buy something in the country you are visiting. That’s what the credit card is for! This wardrobe is based on separates to allow maximum flexibility. Also cardigans and jackets, and layered tops allow you to create more looks. Similarly if you pack a dress choose one that allows you to wear a T shirt underneath to increase the options. Choose two colours that you like and work well together. People often base their holiday wardrobe on Black and White. Boring. Don’t do it. Choose something a bit different – what about brown and pink, purple and silver, red and turquoise, or yellow and green? Let’s call the colours A and B, and each item can be plain, or a pattern (at least 50% of which is in the main colour). Cardigans can be exchanged for a light jacket. Choose four sets of separates that work together but are interchangeable. Five additional T-shirts which go with A and B – say 2 long-sleeved, 2 short, and 1 vest so they can be layered. Pack carefully, with the shoes and heavier items at the bottom. Soft bag or rucksack including passport, tickets, Kindle, pen, make up, credit card and small purse, phone, and transparent bag with small containers of moisturiser, shampoo, deodorant, sunscreen. Of course over two weeks your clothes may need a wash – I usually find a laundry/launderette, or hand wash.
Esme says this is way too complicated. The simple version is – choose four co-ordinating outfits in two colours. Add four co-ordinating tops. Wear neutrals for travel. Wow. I love that you’re well dressed, even when travelling light. I deffo embrace the travelling light thing, but haven’t really embraced the well dressed thing. I’ve gone the reductionist route: 1 pair denim jeans, 1 pair shorts, 1 pair linen trousers, 4 white T-shirts, floaty scarves for dressing up the Ts, light jacket to wear on plane. Footwear, well, that’s why there’s space in the bag… I can buy more shoes when I’m away! Make space for things to happen! I love that. Thank you Jayne. Great tips.The best advice I ever had was to take just three socks and wash one overnight, so you never wear a sock that is more than two day’s old.